Pierluigi Marconi and Roberto Ugolini, two engineering students, were only 23 years old each when they submitted a project for a revolutionary motorcycle to the Bimota company. The bike was the subject of their final degree thesis - "Tesi" in Italian. Powered by a 400cc Honda V4 and built under the technical direction of Federico Martini, their design was shown at Milan in 1983. It was distinguished by its hub-center steering, which was controlled by hydraulic rams, and its carbon-fiber frame. When the Tesi appeared the following year, it was powered by a 750cc Honda V4: Bimota entered it for races with Davide Tardozzi as rider. The bike's development proved trickier than anticipated - some of its advanced features had to be abandoned. A third version, with a simple tubular frame, appeared at the end of 1985. An FZ 750 Yamaha engine replaced the original power unit in 1987, and a subsequent revision in 1988 dropped off the hydraulic steering in favor of bell-cranks. Marconi, who had become technical executive at Bimota, reopened the project in late 1991. 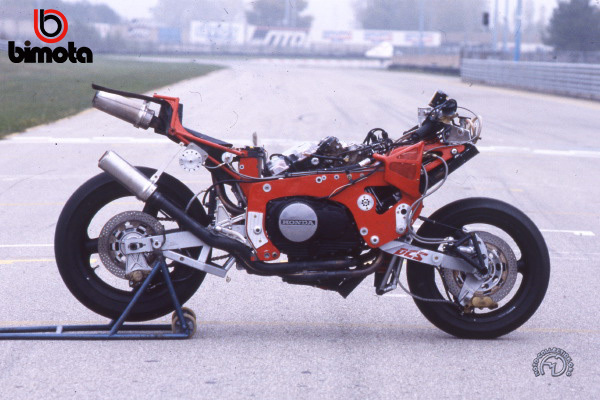 The Tesi reappeared in a "street" version with a Ducati engine. Intended to be built in series, this version has not yet gone into production, though Bimota ultimately plans to make this latest Tesi its flagship model.